Below is a short commentary on a fun article I recently read. (See link below.) The Online Business Degree put together a list of the best teams ever assembled. I read through the list and agreed with most. Some sounded a little contrived, but workable. Here are my reactions. Yes, they were the finest basketball team ever assembled, but they were also professionals. I thought the Olympics was supposed to be amateur. I vaguely remembered a guy named Jim Thorpe losing his metals because he was accused of accepting gifts. I’m behind the curve on this; maybe The Olympics has turned pro, and I missed it. But the Dream Team always seemed odd to me. Sir Arthur Conan Doyle created Sherlock Holmes and Dr. Watson as fictional characters. They weren’t real. But they sure had some fun adventures, and the recent Hollywood film is pretty good. Doyle presented them as pretty good team, I must admit. Still… it’s hard to get behind them as a real team. Now here’s a great team! Nothing fake about them. This was some of the greatest music of the Twentieth Century. Worthy of our worship (figuratively speaking). Have you seen how SEAL teams are trained and formed? Watch the documentary some time… It’s amazing!!! Yep, I’d go with them too! Millions of people around the world still listen to their music. But “more famous than Jesus”? I don’t think so. Don’t know much about sports, so I can’t comment much. But hey… if they won a Super Bowl they had to be pretty good. Another fictional team. Humm… I’m not convinced fictional teams work for me. It’s easy to write fiction because the characters don’t actually have to accomplish anything. You can just write up a bunch of cool scenes and you’re done. Can I learn anything from fiction? Yes. But generally, non-fiction is the most inspiring to me. Now here’s a real super hero team! These guys went to the moon with less computing power then an iPod. Pretty amazing when you think about it! Wonderful team of comedians! I’ve always enjoyed them. Yes! Another great team of scientists that I can get behind. Most people don’t know how great these guys actually were, and how they literally saved the world. But sadly… most people don’t know history. If I had created the list, I would have dropped the fictional teams. Sure, they sound great, but it’s debatable how much they actually inspire. For instance, Sherlock Holmes was a pretty smart character, but most people find it difficult to pattern their lives after a character in a novel. It’s like trying to be more like Huck Finn or Indiana Jones. It’s entertaining, but not inspiring. Lastly, I would have liked to see “The 12 Disciples” listed as a team. Jesus didn’t pick them for their skills and awesome speaking abilities, but in the end they changed the world. That kind of power can’t be ignored, and they are men you can comfortably pattern your life after. Overall… it was a fun article. It was well thought out, and fun to read. Regardless of the role you play in company projects, you will likely see three primary personalities in the project management and executive teams. In other words, if you are involved in engineering a product, or managing the development of a new product or service, holding the executive reins of a company with project management, you will likely see individuals with the following three personality drives. These three primary issues drive their thinking. The time conscience “On Time” person primarily worries about project schedules. When will each subsystem be finished? Each milestone? Each Phase? And when will the project ship? This person studies and observes all the team interaction with dates and times in mind. Is the project going to be late? If so, what can we do to fix that? His first suggestions are to defer features for a later release, cut the scope to something more manageable, and to create a smaller, foundational release that can be improved upon later. In other words, meet the agreed-upon ship dates at all cost, and defer more advanced things until later. The cost conscience “On Budget” person thinks much like the On Timer. He thinks primarily about project costs. Blow the budget by a dollar, and he freaks out! And since the biggest cost in most project is human resources and salaries, he’s thinking the same thing as the time conscience person, “get the project done on time so you don’t blow my budget. And if you don’t think you can get it done on time, cut something so my budget isn’t wrecked.” Time and budget go closely hand in hand. The quality conscience person primarily thinks about the consequences of releasing a bad product. What will the marketplace say? How will customers receive it? And the Press? It’s hard to recover from bad press or a mainstream revolt against your product. You could lose millions of dollars just from a Facebook uprising. It would be far better to spend an extra month getting right, or an extra $100K, than to suffer a marketplace meltdown. So you see that these personalities can be in conflict from time to time – not exactly harmonious at all times. The Quality person doesn’t want to witness a total user-base revolt because of a poor product. The budget person doesn’t want to sink the company in debt. And the schedule person doesn’t want customers to walk away all because the product took too long to deliver. The best hope a company has is to recognize that these personalities can all exist in one project management team. Recognizing each one for its merits goes a long way. Sometimes people just want their input valued. The next step is to work together toward mutually agreeable compromise that includes input from each driving force. Hopefully, the result is a good quality product that doesn’t ruin the company in debt and unresponsiveness. I ran across a nice video of how to take baby steps to implementing time tracking within your organization. It’s worth watching. Follow the link below for the video. The theory is that you can get immediate value from a time tracking product like Standard Time® with minimal input. And then after implementing the product, you can take several baby steps to gaining incremental value. It’s up to you when you reach the point of diminishing returns (when more employee participation yields less value). But this program has enough upward latitude to allow you to explore the upper limits of your company’s needs. Follow the steps and see what you think! There are no big problems; there are just a lot of little problems. Henry Ford was the genius of the 20th Century assembly line. He almost singlehandedly designed the Model T and Model A Fords. Those two cars were the workhorses of the early 1900’s. So when Henry speaks of “little problems” he’s talking about inventing the entire automobile industry. But that’s big enough for anyone. His point, though, is that in engineering you have dozens of little issues to deal with. And they stay with you indefinitely. In other words, engineering is a constant fight with little problems that you must work out with patience and perseverance. If you don’t have the aptitude, don’t get into engineering! 1. One of the biggest problems engineering people have is balancing quality with cost. Any engineer can tackle the myriad of little problems before them. But can they do it cost effectively? In other words, does it take forever to solve them, thus costing a fortune? Or can they resolve each one rapidly and without expensive solutions. The balance between polishing your work in a craftsmanship style, and pumping product after product out the door is a big, big problem that requires a lot of thought. 2. The next biggest problem engineers face is collateral damage from engineering fixes. I.e. bugs. Here’s an example: Say you are an electrical engineer designing a printed circuit board. And in your haste to produce a cost effective product, you forget a circuit trace. The manufacturing department is now forced to hand-wire that trace. It now costs your company much more in the long run. That’s a bug that must be retooled. 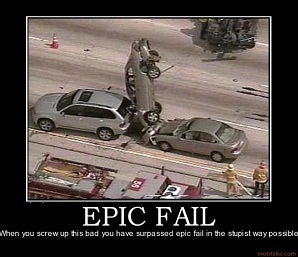 Things like that happen in every engineering discipline. It’s definitely the next biggest problem you must face. 3. The final big problem engineers face is time estimates and project schedules. Engineers do not think like other human beings. They cannot estimate time with any degree of accuracy. And they do not like being interrogated about how long their work will take. You’ll just have to wait until it’s done, they’ll say. I’m working as fast as I can. Problem is, big money is riding on their engineering work. Sometimes the company just can’t wait. It the engineer that has to hurry up and product the product on the company’s timeline. And that can lead to big battles. So this is a fairly big problem facing engineering departments and company executives. Inexpensive cloud solutions are getting more and more attractive. Not only do you get a great app, but you get external hosting and support. So instead of spending your in-house resources on server hosting, patches, backup, upgrades, and babysitting, you can spend it on your core competencies. Another up-and-coming cloud app is timesheets – check out a product named Standard Time®. Their cloud-based timesheet is superb. And just like the simpler apps described above, all the support is handled by the vendor. But this is no simple app like storage or email. This thing is loaded! Check out some of the features you get for $13 a month! Of course you would expect this. It’s a timesheet, after all! But the timesheet is extremely flexible and comprehensive. Employees only see projects assigned to them. Project tasks are included. Sub-projects and phases show a full hierarchical breakdown. There is an expense sheet, and time off tracking. In addition to the timesheet, Standard Time gives you project rollups. (Yes, this is all on the cloud! Pinch yourself!!!) They let you track actual work verses estimates. Track percent complete. Attach documents to tasks. Need to track comp time for employees working over their scheduled hours? Got it. Need vacation tracking? Got it. How about automatic time off accruals on a daily, weekly, bi-weekly, monthly, or yearly basis. That’s in there too! What would a consulting tool be without cloud-based expense tracking? It’s in there too. In fact, you can run a client invoice that contains all the timesheet hours plus expenses. Or, you can run a report that includes them both. Or separately. There are even custom reporting capabilities. It’s a little hard to believe that cloud-based hosted services have evolved this far. I guess somebody’s been hard at work. Check out Standard Time if you’re a consulting firm, manufacturer, or government office. Here’s a link to their YouTube channel. New videos are posted all the time, so subscribing is a good itea. Are you beginning to think your project may be a total wreck? Is it way over budget? And does anybody but you care about that? Does it bother anybody that there’s no end in sight? And feature-creep never seems to end? If so, that’s a sign that your project has gone off the rails, and is doomed for failure. Chances are you’re not the only one who’s noticed. A dark cloud of failure sometimes descends upon project from time to time. I’m not sure if anybody really knows why. It just happens. I suppose you could call it a “perfect storm” of incompetence, wrong choices, and apathy. When those circumstances form up into that dark cloud over your project, forget it! You’re done! This begs the question of whether there should be an assigned person whose responsibility it is to watch for telltale signs of failure. Such a person should first of all have been involved in a few epic failures so he knows the signs. Peering into the hazy fog doesn’t do anybody any good. If your project is consistently blowing past half the milestones (evaluation points), then you clearly haven’t identified all the work required. And if that’s the case, your project may last 2 – 3 times longer than expected. Is that okay? Can the budget hold that much water? Are your project team members gossiping about management? Has water cooler talk all gone negative? If so, the team may have lost its moral. Employees can’t always pinpoint the problems, but they sure can gripe. If that’s happening a lot, then you project may be in trouble. Can team members see the light at the end of the tunnel? Are you making progress, or just spinning your wheels. You had better see some progress or you might be in a death march. This is when overtime rises to 60 – 80 hours per week. You’re working weekends to meet a vague deadline that has no obvious payoff. And you get the distinct impression that you’re still climbing the hill rather than sledding down the other side. Project leads say you’re just about finished, but you get the sense that that isn’t true. Why else would the work keep piling up? As we said earlier, the only way to pull out of the situation like this is for a whistleblower to call it. Do you have one on your team? If so, chop the product into quarters. Deliver what little you have done now. Take a big break. And then take up the monumental challenge of boiling the ocean. Maybe your project is just four times bigger than you first imagined. Here’s a link to YouTube video that could help. This is a timesheet project that may have a few answers, and may impose some order to your project. It’s worth a look. Preleveled Start: The starting dates of all tasks in a project plan before a resource leveling operation was performed. 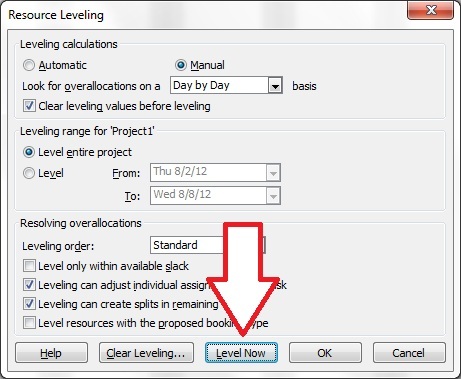 If you use the resource leveling feature in Microsoft Project, you might consider adding the “Preleveled Start” and “Leveling Delay” columns. These two columns help explain the effects of a leveling operation in MS Project. The Preleveled Start field shows the dates that the tasks were before the level, and the Leveling Delay tells the amount of time each task was shifted to avoid over-allocation. Consider the screenshots below. They demonstrate the Preleveled Start field and Leveling Delay. The first screenshot shows the fields before the resource leveling operation. In this example, we have two tasks that occupy the same calendar date range. Obviously the resource cannot complete both tasks at the same time. We must move one, or split the tasks so they both can be completed. But here you have a decision to make… can the resource multitask or must the second task follow only after the first has been completed? Certain tasks like “Foundation” and “Framing” and “Roofing” cannot be multitasked. They must be completed in sequence. In this case, the normal leveling choices are best. In actual life, the resource will probably multitask both project tasks, which has the effect of pushing them both out. The screenshot below shows the resource working 50% of his time on both tasks. That doubles the amount of time the tasks take, but allows the resource the luxury to spend whatever time they want on the tasks. This only works when the tasks are not mutually exclusive. In other words, the second task can be performed at the same time as the first. Or, they don’t have to be performed serially. But if you really want to use resource leveling, you’ll find that MS Project pushes one task out past the first one to that it starts when the first one ends. Use this approach when you cannot work on the second task until the first is completed. In other words, multitasking is not possible for these two tasks. The screenshot below illustrates this. This dialog box is displayed to help choose the leveling options.